Back in 1982 a lot of music video coming fast and furious and the traditional ways of discovering new bands [radio, press] were not relevant to my non-mainstream tastes. Music video, for a brief time, skewed the traditional US rock power hegemony towards those bands [chiefly British] that were visually literate and knew a thing or two about music video and presentation. It must be remembered that MTV had just gone on the air the summer of 1981 and were hardly seen as a sure thing. In fact, much of America, including the biggest cable markets like NYC, were largely not getting MTV carried on their systems. 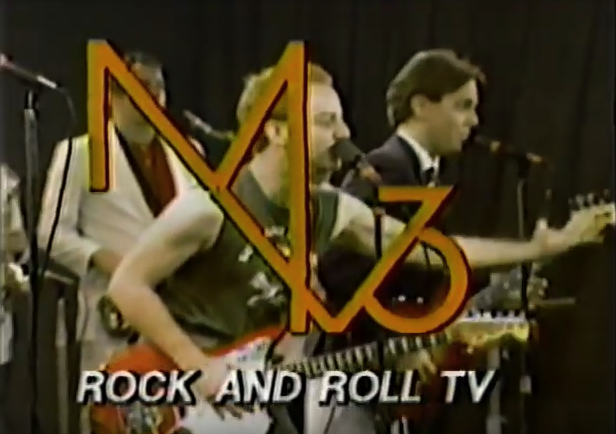 Old hacks like myself may remember the “I want my MTV” ad campaign that had big stars like Bowie and Pete Townshend admonishing people to call up their cable company to request they carry the channel in a series of TV ads. There were other outlets that thrived in MTV’s wake; in some cases reaching markets that MTV would not have for years via the more traditional syndication method. It was the spring of 1983 when a low power UCF channel in my area started carrying MV3. MV3 was a daily [!] 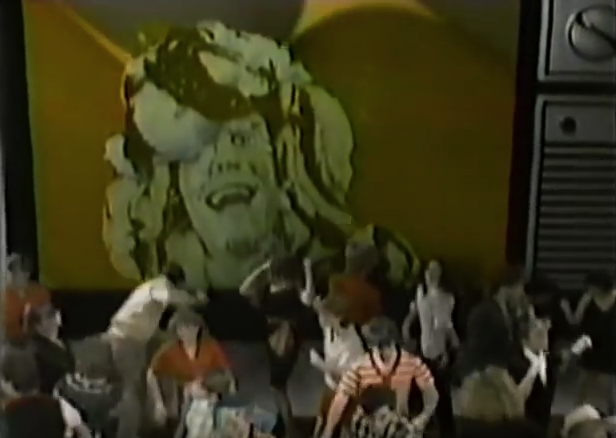 hour-long music video program that was sort of like American Bandstand except that it was almost 100% New Wave. The show was taped in a studio that was packed with SoCal teens grooving to the latest hits as played on the influential KROQ-FM. I had heard of the station when Posh Boy started releasing the “Rodney On The ROQ” compilation albums in 1981, but living on another coast, never had the pleasure to hear it. 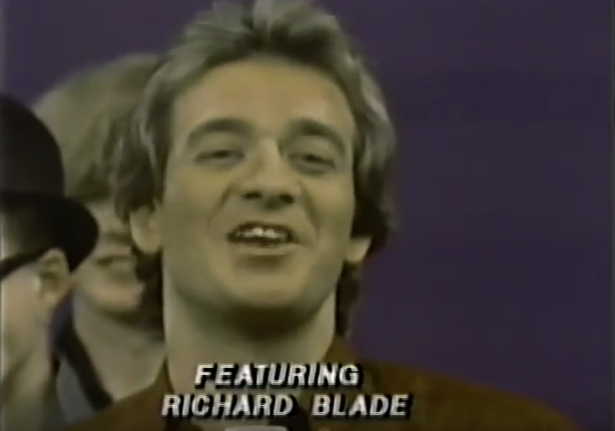 Since Rodney Bingenheimer had a face meant for radio, the show opted for the more photogenic Richard Blade, a top rated DJ at the station to anchor the show. The Brit had cannily expatriated to the US just in advance of the Anglophilic wave that soon swept America in the early 80s as a direct result of the confluence of MTV playing these British acts the radio would not touch as well as the upstart “Rock of the 80s” format that KROQ spearheaded. That Blade was a pro who knew his stuff made him a smart choice. 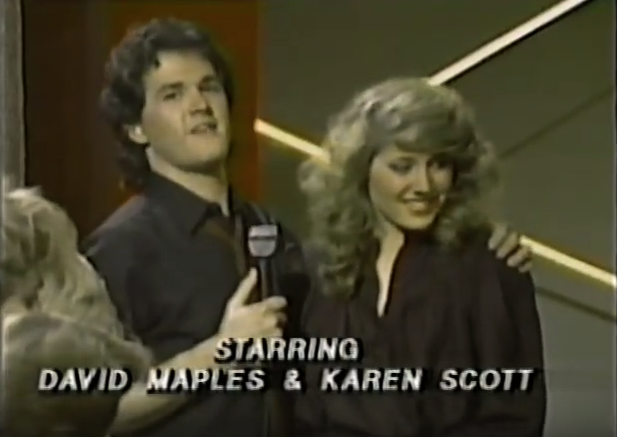 The co-hosts were a pair of kids closer to my age; David Maples and Karen Scott. Maples was a goofy Mickey Dolenz-type and Scott? Well, she had big, poofy hair as the photo at right certainly proves. Each day the show would play a video that would be keyed into a giant TV wall on the set [Director to kids: DON’T wear blue!] while the director cut between the clip itself and the grooving teens. A tried and true formula updated to the music video age. Can you name that video? I can! I saw many interesting bands endemic to the L.A. New Wave scene like Berlin and Oingo Boingo and the interesting thing was that while they would show up and lipsynch a song or two in between being interviewed by Blade, the songs they played might be deep cuts a million years away from ever being a single! I still have videotape of Oingo Boingo playing the blistering title track to “Nothing To Fear” and hearing it for the first time there. Occasionally, there would be British acts hitting the L.A. market and showing up for a little promo. I recall seeing The English Beat and Wham! back when they still had an exclamation point [probably not their homage to Neu!]. I remember getting a handle on Paisley Underground bands for the first time here when The Bangles appeared while they were still on Faulty Products with their debut EP. Likewise, I first encountered the charms of The Three O’Clock when their “Baroque Hoedown” EP on Frontier was a going thing. They played “With A Cantaloupe Girlfriend” and reached my eyes long before “Jet Fighter” got a grudging play on MTV. Better still, the occasional video got played all the way through without cutting to the kids dancing. Often this was a clip that was never in a million years on TV’s playlist. As a music video collector, this was the primary draw of the show for me. Of course, what was primarily played was “mainstream New Wave” material that was hot on KROQ but had not yet crossed over to the Top 40 [but soon would]. Acts like Duran Duran and Adam Ant were MV3 royalty. The show stopped almost as quickly as it had appeared and the hosts went their own ways. Blade has stayed involved with music in addition to his forays in acting [probably the reason he decamped to SoCal in the first place]. He remains a DJ with an old wave show on satellite radio still working that action. He compiled a great series of New Wave CDs for Oglio Records in the early 90s that were sterling examples of the form long before it became a tired cliche. Maples became a TV writer [“Home Improvement,” “Rugrats”] while Scott has simply faded away. This entry was posted in Uncategorized and tagged 1983, KROQ, music video, MV3, Richard Blade, TV show. Bookmark the permalink. I should have paid more attention to MV3 at the time! By the time it was playing in the SF Bay Area, we’d already had MTV for a year and I couldn’t see the sense in tuning in for just an hour a day when I could just leave it on MTV. Also, it was before we had a VCR–maybe if we’d had one, I’d tape it to watch later, perhaps during the two interminable videos which were at that time the bane of my existence: Meatloaf’s “Paradise by the Dashboard Lights” and Springsteen’s “Rosalita”. Jon – Well, it’s true that MTV was at its most watchable at that time, but by 1984 the bloom was off the rose, and once Bruce Springsteen made a music video: game over! MTV was by that point the ego drug of choice for the Dinosaurs That WOULD NOT DIE! Have you read ‘I Want My MTV: The Uncensored Story of the Music Video Revolution’? Great book covering similar ground that I’ve just finished. MattP – I was aware of the book, but had mixed feelings on reading it. The golden age of MTV was exceedingly brief to these eyes. I don’t know if I want to read about anything past ’84 or so. My wife borrowed the 20th anniversary DVD of “Purple Rain” from a co-worker and the second disc had the MTV premiere party on it! Edited down to about 30 minutes of Mark Goodman interviewing celebs and a grim reminder of what MTV was like in its death throes. Brrrrr! Great memories! I remember this show as well as the music video shows that Richard Blade hosted. I grew up on KROQ and these shows – it’s a place and time that hasn’t been experienced since – didn’t know how lucky we were before everything went corporate. I had assumed that all the KROQ bands were huge because I’d see their videos on MV3 (and MTV, Night Flight, and between movies on HBO) and at the time I thought that Southern California was the center of the universe. MV3 was on KCAL (Channel 9) and a later iteration was hosted by Blade alone on a UHF channel followed by Wally George. I never really like Blade as he took Evans’ place on the Raymondo and Evans morning drive show. One would often run into dancers from the show at 321, Florentine Gardens, Fabian’s, … who would always let it be known that they were on the show (and, yeah… I’ll admit – I was jealous). ulgyblackjohn – Welcome to the comments! 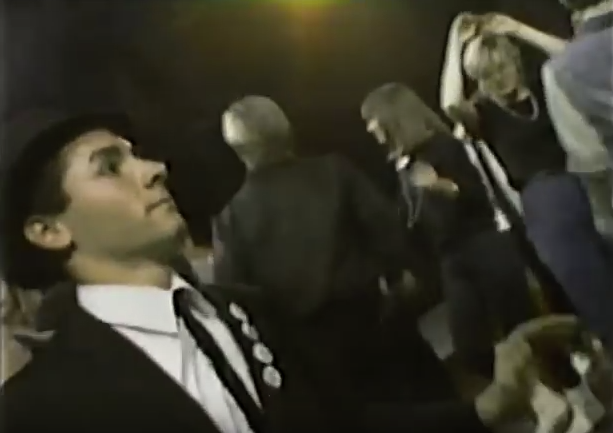 So you had to put up with attitude from dancers on a TV dance show in SoCal 35 years ago? I was so far removed from that scene in Orlando, Florida, that it never occurred to me. But even John Waters has written about the teens on TV daily in Baltimore in the early 60s when he was growing up and it’s clear that teens and showbiz don’t mix; no matter what the size of the market! I read a book about Soul Train and I found the parts in there about the dancers to be interesting. When I watched it as a kid I just thought they were all happy people having fun, the idea that they may be pros or regulars never entered my mind. No, the one that I read was “The Hippest Trip in America” by Nelson George. Mine was quite good, how was yours? Tim – Okay. Kind of mediocre, but still informative. I should read the one you had read. When I looked up the name of the book via google I received a link to a companion documentary on YT (I think you’re averse to using both, if my memory is correct).The doc on YT was made by VH1 and covered a lot of the book but in less detail. The book that I read had a lot more bio of Don Cornelius than the documentary and there was quite a lot of info about the dancers. Toni Basil wasn’t mentioned at all and in the book that I read one of the dancers, who is Asian, talked a lot about how much she was accepted (or not) and in the documentary was a smiling nodding cameo at the very end. I realize that a one hour show isn’t going to capture the book but this was way different. Is the Blade mentioned here the same person who does Pet Shop Boys mixes on Soundcloud? Always wondered…. Tim – No, KROQ’s Richard Blade has only three tracks on Soundcloud. Two “custom answering machine messages” (?) and a phone interview with Billy Idol.